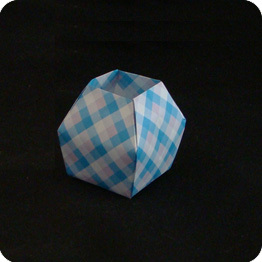 This Origami Vase is a little tricky to make, but it is a beautiful container with clean lines and a great silhouette. As with other paper creations, this vase is quite light and can easily tip over. Place something heavy inside the vase to weight it down (for example, decorative rocks or a handful of uncooked rice or beans). 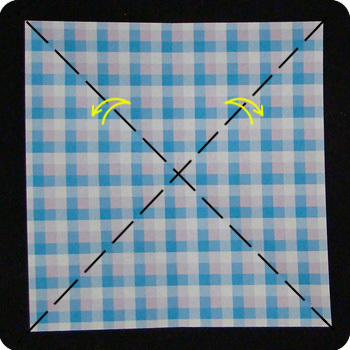 Fold and unfold along the diagonals to make an X shaped crease. 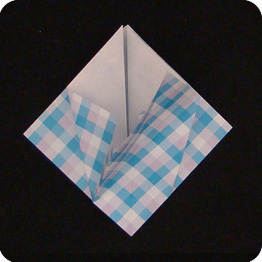 Fold and unfold the paper in half (left to right). Make a Preliminary Base. 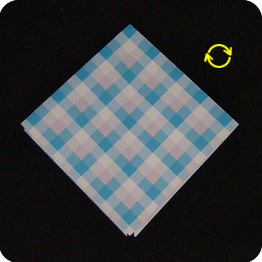 To do this, push the top corners down and towards one another. Allow the front to come up towards you. Swivel the flap pointing towards you to the right. 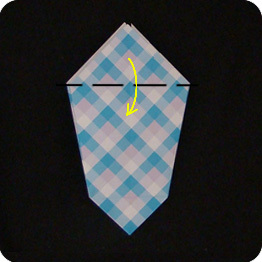 There should be a similar flap pointing behind, swivel this one to the left. 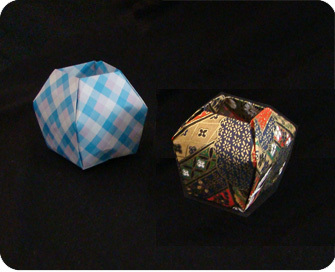 This is called a Preliminary Base and many origami models start with this basic form. 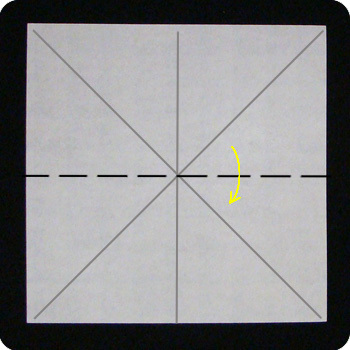 Rotate the Preliminary Base so the open-end is pointing up. Fold in the left and right flaps. 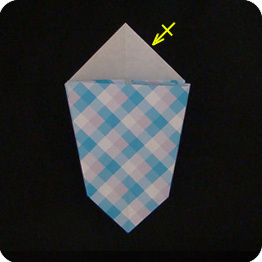 Make the fold at a slight angle so the origami vase will be wide at the top and narrow at the base. Repeat with the back two flaps. 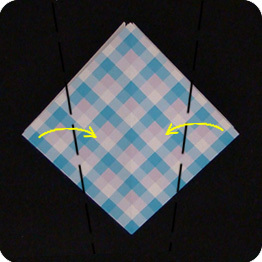 Fold the bottom tip up (this will be the base of the vase). 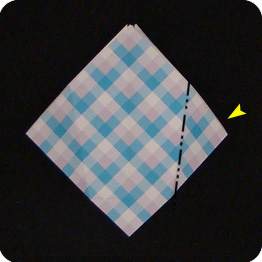 Unfold the last few steps so you are back at the Preliminary Base. 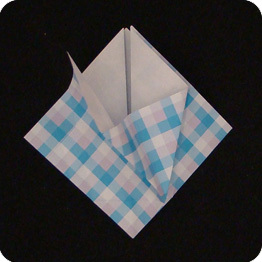 Perform the Sink Fold. 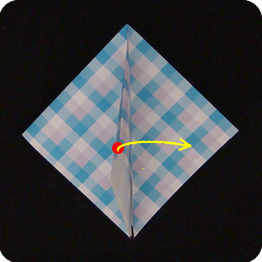 To do this, lift the top-right flap, separate the two layers of paper and push the corner in between the two layers of paper. 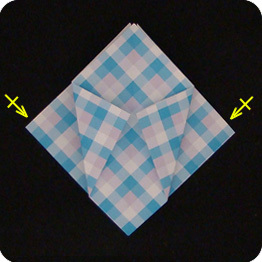 The folds will follow the creases made in step 6 but they will be mountain folds. 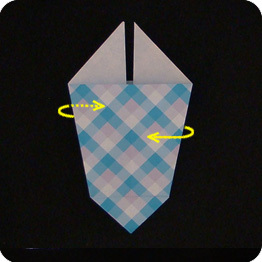 Repeat on the top-left flap. Repeat the Sink Fold on the back two flaps. 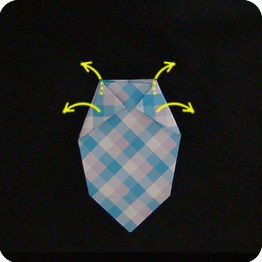 Fold down the top part of the model (fold down triangle). 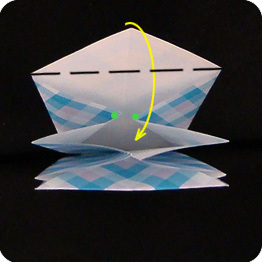 This step is tricky: Fold the flap back up and tuck it inside the model. 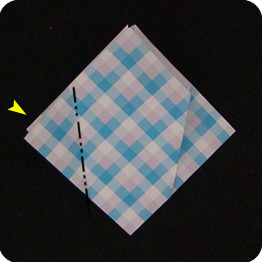 This triangular flap must cover two of the layers visible inside the paper. See next two photos. 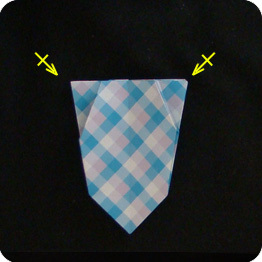 This is the incorrect way to fold back the triangular flap. 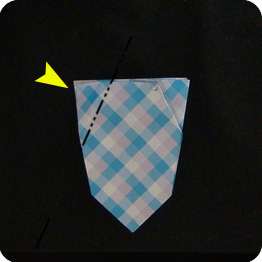 Note how the corners marked with red arrowhead are still visible. This is the correct method. 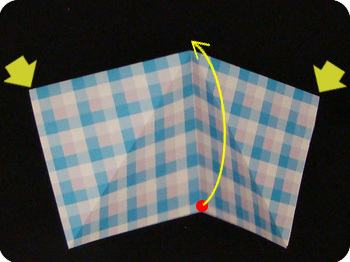 Note how the two corners are now under the triangular flap. 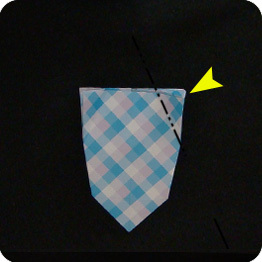 In the next step, the back flap has to cover the corners marked by green circles. Repeat with the back flap. See previous photo for details. 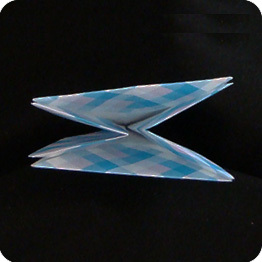 Once the triangular flaps have been folded in properly, then it is time to move on. 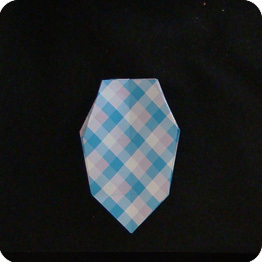 Like turning the pages of a book, swivel the top-right flap towards the left. 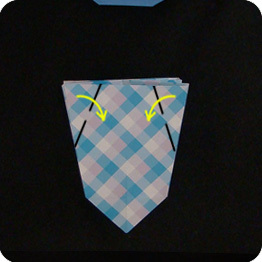 At the back side of the model, swivel one flap from left to right. 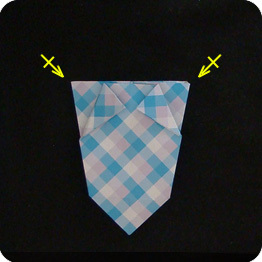 Again, fold the top triangular section back and tuck it inside the model. 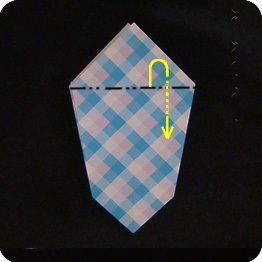 In this case, the fold & tuck is easy and straight forward. Form the mouth of the vase: fold in the left and right corners. Make the mouth narrow compared to the body of the vase. 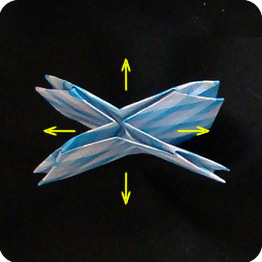 Unfold the last four folds. Pry open the layers of paper. 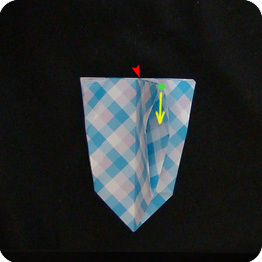 Pinch the model at the red arrowhead and push the corner (green dot) so it is inside the layers of paper. 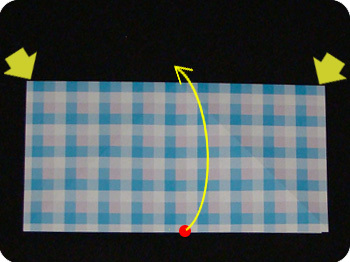 Follow the creases made in step 19 with mountain folds. 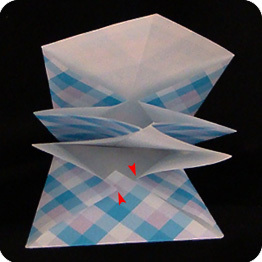 Repeat on the top-left side of the model. Push in at green dot. 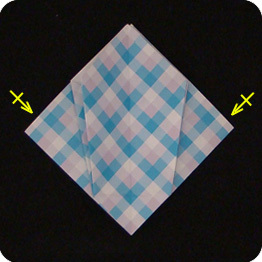 Repeat Sink Fold on the two back corners. Almost done; just need to inflate the model. 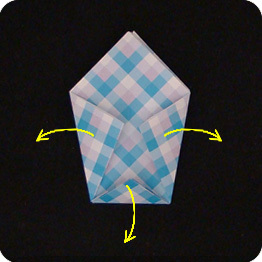 Insert your finger into the center of the vase and ease open the layers of paper. 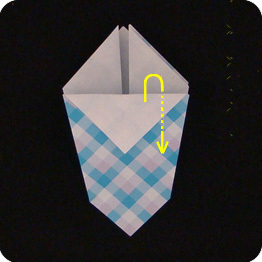 Be careful not to undo the corner Sink Folds (step 22 to 24). 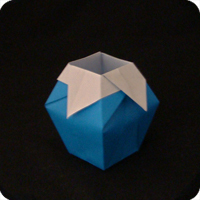 A beautiful Origami Vase waiting for some flowers.